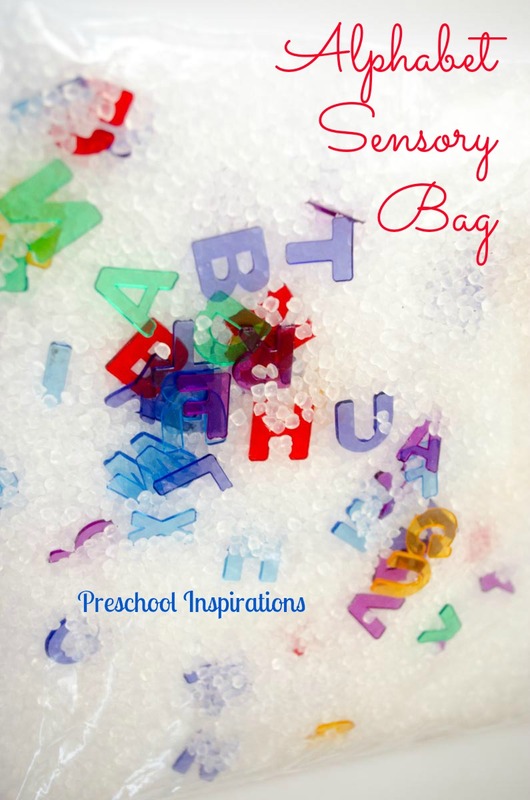 Isn’t this alphabet sensory bag so inviting!?! We have been enjoying squishing it and finding the alphabet letter jewels hidden in it. 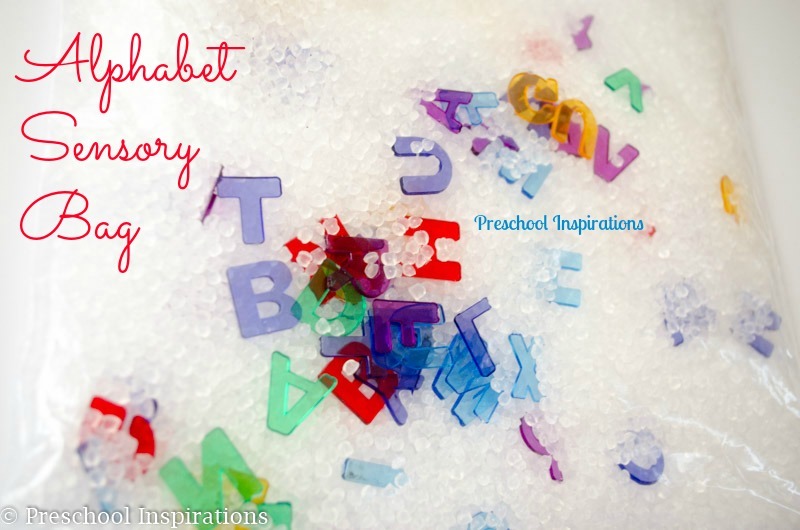 It’s the perfect blend of learning the alphabet and sensory exploration. 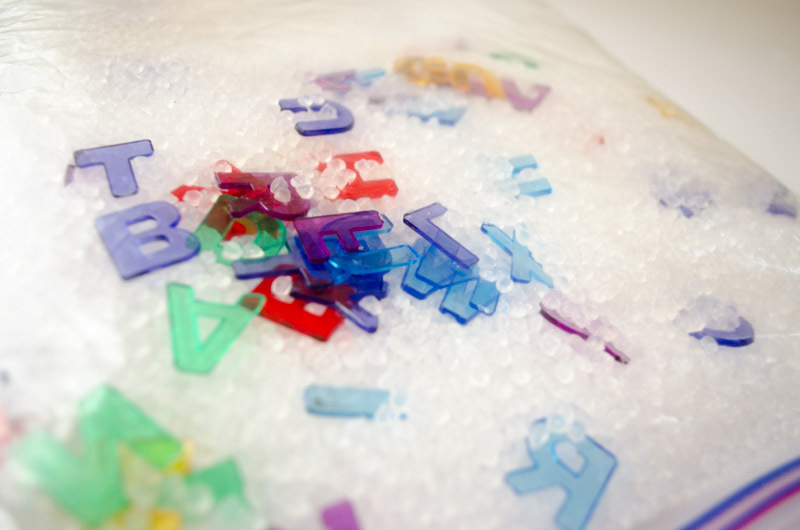 This alphabet sensory bag works two-fold. It is a great and fun learning activity, but it is also a tool. A tool for helping young children appropriately seek out sensory stimulation. Thankfully, now I have a much better eye and ear for what Sensory Processing Disorder looks like. I’ve even had the incredible opportunity to review the book Sensory Processing 101 , a comprehensive book about the sensory systems, written from two very important perspectives — a parent’s/educator’s and a therapist’s. I wish this book was available to me 14 years ago when my early childhood teaching career began. Unfortunately, there was almost nothing available at that time. In fact children who were struggling with their sensory seeking behaviors had almost no support. We are learning more and more about how sensory experiences are a necessary part of everyday life for children. Don’t make my mistake! There’s no need to when we have resources available to us now! Our alphabet sensory bag is an idea I came up with after reading about sensory bags on pages 114-115. It’s super simple to make! Put 16 or more ounces of poly-pellets into your gallon sized bag. Add as many letter jewels as desired. Duct tape all the edges of the bag, and play! Definitely keep an eye out for wear with the bag, since a very small hole is big enough for the beads to start escaping. I’d love to hear of a sensory tool you use for children too. If you are interested in reading more about sensory systems, sensory seekers, or Sensory Processing Disorder go to Sensory Processing 101. You can also find the ebook version there. I use the plastic VOSS water bottles for sensory tubes. I fill them with miniature items and rice. Some have shapes, letters, miniature barbie items (household items), and miniature food items. I always glue to the lids as well so the littles can’t open them. They’re a big hit here! Oh I LOVE sensory bottles and discovery bottles! Aren’t those the best, and the VOSS bottles are so inviting for them! It’s a pleasure to have you visit, Peggy!